Stainless steel case with a stainless steel bracelet. Fixed stainless steel bezel. Black dial with luminous hands and index hour markers. Minute markers. Dial Type: Analog-Digital. Digital display. Quartz movement. Scratch resistant sapphire crystal. Solid case back. Case diameter: 43 mm. Case thickness: 15.5 mm. Deployment clasp. Water resistant at 100 meters / 330 feet. Additional Info: digital chronograph, touch screen, alarm, barometre, stop watch, compass, split time, timer, calendar, two time zones. Casual watch style. 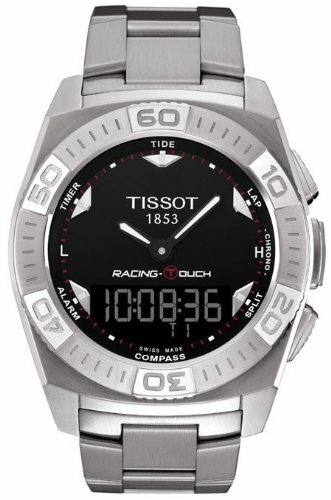 Tissot T-Touch Racing Stainless Steel Mens Watch T0025201105100. If you have any questions about this product by Tissot, contact us by completing and submitting the form below. If you are looking for a specif part number, please include it with your message.